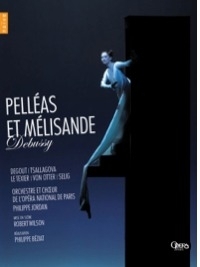 Debussy's writing for the voice in Pelléas et Mélisande partakes of the starched, corseted artifice of Maeterlinck's dialogue, yet his orchestral soundscapes span worlds from L'Après-midi d'un Faune to La Mer. How to square this circle? Philippe Jordan presides over this exemplary reading like Prospero over The Tempest. Nothing feels accidental, yet nothing feels forced, the rare fluency of the singers' cadences paradoxically complementing the analytical yet electric character, edge, gesture, color of the instrumental voices. The production? Oh, that. It's vintage Robert Wilson, introduced at the Salzburg Festival and at the Paris Opera in 1997. As www.robertwilson.com has it, "Since the late 1960s, Robert Wilson's productions have decisively shaped the look of theater and opera. Through his signature use of light, his investigations into the structure of a simple movement and the classical rigor of his scenic and furniture design, Wilson has continuously articulated the force and originality of his vision." (Ipse dixit. Emphasis added.) The unstated corollary is that within the history of changing judgments and interpretations (what Germans call Rezeptionsgeschichte), Wilson's stagings of preexisting repertory have no standing at all. That said, his Pelléas — filmed in March 2012 in its fourth local run — holds up exceptionally well. His studied, somnambulistic poses and processionals suit the enigmatic narrative. So do the shifting shades of blue that suffuse the stage like varying densities of a single vapor. Rare flashes of other color (red for rage, green for jealousy) inject violent accents of the dramatic, if not of actual drama. The lovers in their innocence wear white; the rest of the cast wears timeless black. Props are conspicuous by their absence: there is no letter from Pelléas for Geneviève to read, no ring for Mélisande to drop into the well, no well for her to drop it into, though a luminous O on the backdrop throws a bone to the literal-minded. Mélisande never lets down her hair. A cortège of bunhead lookalikes passes in silhouette to mark her passing. The cast assembled here takes to Wilson's stilted robotics as naturally as to Debussy's grave, fastidious inflections. As Mélisande, the wide-eyed Elena Tsallagova fills out Wilson's spacious poses with the feline self-absorption of a Tang-dynasty princess, her voice as cool and clear as a wind chime. Disserved by a chunky frock coat, Stéphane Degout's engaging Pelléas lends his baritone the light glints of a tenor, phrasing the love music with deep rapture. Stony of profile, Vincent LeTexier invests Golaud with a gloomy dignity. In her carriage and cultured tones, Anne Sofie von Otter's Geneviève is every inch the queen. To the clueless old king Arkel, Franz Josef Selig brings a rolling bass that falters under pressure. Jérôme Varnier, whose jet-black sound and intense focus deliver a jolt in the single line of the Shepherd, returns in the final scene as the Doctor, showing the chiseled features of a saint from Chartres Cathedral. (Elsewhere, he has sung Arkel.) Yniold falls to the petite Julie Mathevet, a rising Zerbinetta and Queen of the Night, under­employed here in the trunks and hose of a mid-century Rosencrantz or Guildenstern, piping in blanched tones. Precedent for a woman en travesti in this role goes back to the premiere of the opera. But Debussy seems to have wanted a boy, and many, in my experience, have made the little prince's terrors more real.